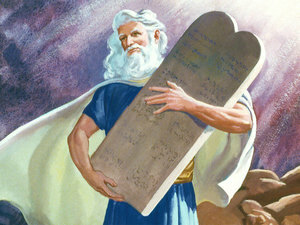 Anon: "Why is it that images of the Ten Commandments are almost always portrayed anachronistically, with English text and or Roman numerals in place of the original Hebrew? We apologize to anyone who is offended by any of the above quotations. Including humor in a religious discussion is always chancy. The Ten Commandments (a.k.a. Decalogue) is a set of behavioral rules which appears in three separate locations in the Hebrew Scriptures (Old Testament) of the Bible. These have historically been accepted by Judaism, Christianity and Islam as a summary of the most important rules of behavior that God expects of humanity. Slightly more than 50% of humans on earth follow one of these three religions. There is considerable debate in the U.S. whether the Decalogue should be posted in public schools, public parks, government offices, etc. There is a growing consensus that monuments containing the Ten Commandments should not be displayed by themselves on government property, because that would be widely seen as promoting one religion, or a small group of religions, as superior to other religions in violation of the First Amendment to the U.S. Constitution. However, many people have no objection if they are shown in a cultural display along with other examples of ancient and modern legal codes. Part 1: What are they? When were they written? Where are they now? Should everyone follow them? Part 2: What people believe the Commandments say? Legal challenges. Attempts to remove 10 Commandment statues. Problems relating to the display of the Ten Commandments in public schools, public parks, etc. Exactly what is involved in this case? An essay by Rabbi Allen S. Maller: "God's commandment against religious extremism"
"A survey of Anglican vicars in Britain found that while some don't believe in heaven, more than half believe in life on other planets. Worse, only 68 of the 200 surveyed could name all 10 of the Bible's Ten Commandments. The only two that were almost universally remembered were the ones about adultery and coveting thy neighbor's wife; both are no-no's." Although the quotation may seem shocking, being asked to recite each and every commandment is a challenging question. From an unsolicited Email, 2008-MAR-04.